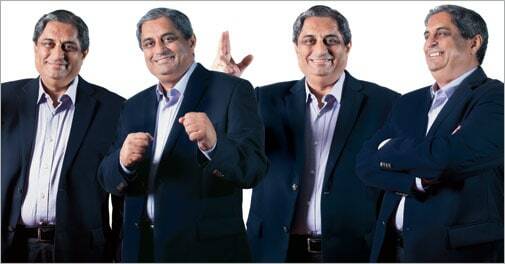 Aditya Puri likes his evening walks. He likes gardening and playing with his dogs. He has also built a bank. One day in the early 1980s, Aditya Puri faced up to his boss Nanoo Pamnani. Puri was then heading Citibank's Delhi operations and Pamnani was the lender's India head. Pamnani was a tough task master and his frequent phone calls would stress out his colleagues. "How much profit do you want?" Puri asked Pamnani, who then named a figure. "What if I give you 50 per cent more," said Puri. Pamnani was more than happy with the proposal. But Puri set a condition: "You have to stop calling me every day." Pamnani agreed. "Aditya gave me very little scope for being tough on him," says Pamnani, now Vice Chairman at Bajaj Finserv, a Bajaj Group company. "He achieved all his goals in the shortest possible time. He was always on the top of his job in terms of revenues and budget numbers. All his clients loved him." That hasn't changed in three decades. Puri, who is now Managing Director at HDFC Bank, remains on the top of his job. He has been at the helm of HDFC Bank since its inception 20 years ago, making him the longest-serving chief executive of any private-sector bank in the country. Over this period, he has built from scratch a bank that is now the biggest in the country by market value and the seventh-largest by assets. The tremendous success Puri, 63, has had may give the impression that he is a workaholic. Far from it. Puri does not believe in putting in long hours at work. He values his leisure time and has created a perfect work-life balance. At Citibank, he would leave office before sunset without fail. Three decades later, come hell or high water, he hits Mumbai's Worli Sea Face every evening for a walk. "I believe if you do your job properly, you will go up in life and in your career," he says. But the man who created a mammoth bank didn't start his professional life as a banker. Puri opted for commerce against the wishes of his air force officer father, who wanted him to study science. What explains his decision to take up commerce at a time most opted for a career in engineering or medicine? Puri says he was highly influenced by his grandfather during his college years. "What you need to know first is what you really want from life," he recalls his grandfather telling him. After completing his chartered accountancy in Delhi, Puri shifted to Mumbai in 1975 to work for automaker Mahindra & Mahindra as an executive assistant to its finance director. What he hated most was travelling 35 to 40 km from his South Mumbai paying guest accommodation to his office in suburban Kandivali. At the time, Puri had a cousin working at Citibank. Puri envied his cousin's perks. When he found that his cousin was going to Beirut for training, he approached Citibank for a job. Pamnani, then not yet Citibank India head but in a senior position, hired him. "He was an outstanding professional, quick on his feet and extremely sharp," adds Pamnani. Puri's Citi stint started with six months of training in Beirut. "Those days Beirut was called the Paris of the East. We had a ball," says Puri with a twinkle in his eye. The training revealed to Puri the bank's work-oriented culture, with its emphasis on meritocracy. By the end of the training, he had a good grasp of the theoretical aspects of banking. The training turned him from just a finance professional to a generalist with knowledge of several fields. "All I knew is that I had to work hard. If I continued and had a bit of luck, I would make it to the top," he says. The next stop after Beirut was Calcutta (now Kolkata), where Puri stayed for a year before moving to Mumbai. It was during the Mumbai days that Puri realised an operations job would not take him to the corner room. He needed experience in marketing. So he switched to marketing, even though it meant moving to a lower grade. "You make it up if you are competent," he says. Puri made it up soon enough. He went on to become the country head for wholesale banking at Citibank in India. After Mumbai, he worked in Delhi, London, Saudi Arabia and Hong Kong. "I learnt to deal with people, clients and regulators across countries," says Puri. In 1992, Dennis Martin, Puri's boss at the time and head of corporate banking for emerging markets, transferred him to Malaysia as CEO with a clear brief to expand the business. His performance impressed the bank's top bosses and he was in the race for more global responsibilities. By that time, however, Puri had started thinking of his next move. He was looking for bigger challenges. India was opening up its economy and there were greater opportunities. His father's illness was also at the back of his mind. It was then that Deepak Parekh, Chairman of Housing Development Finance Corporation, approached him in Malaysia with the offer to head a new bank the mortgage lender was setting up. Puri accepted Parekh's offer. But, as with Pamnani, he set a condition: "You have to give me a free hand." Parekh, like Pamnani, agreed. "It was a phenomenal opportunity to test everything that I had learnt," says Puri. It was also difficult, considering the tough competition. In India, state-owned banks had the distribution network and money power while foreign banks had the products and service capabilities. "We felt that if we could marry the two we would have a winning combination," he says. Puri strategically positioned HDFC Bank as a corporate lender in its initial years due to a lack of branches. Its first set of clients included the Tata and Birla groups and engineering company Siemens. "We got the business because of our superior products," says Harish Engineer, who handled corporate banking at HDFC Bank from 1994 until he retired this year. Engineer vouches for his former boss. "Puri has no personal agenda. He values hard work," says Engineer. Once the bank found its feet, the focus shifted to retail lending. "You have to meet all financial needs if you want to be a large player in the banking sector," says Puri. Retail loans now make up 57 per cent of total lending at HDFC Bank. In comparison, retail business at its two nearest private-sector rivals, ICICI Bank and Axis Bank, constitutes 37 per cent and 27 per cent, respectively. This is despite the fact that HDFC Bank does not offer home loans, a segment reserved for parent HDFC. Unlike some of his competitors, business expansion wasn't the only objective for Puri. Not even when neardouble-digit economic growth in the first decade of this century prompted some lenders to rapidly expand their retail portfolios through unsecured lending such as credit card loans. "Growth was restricted not by the market opportunity but by the target market. We didn't go out to say that we want to deal with everybody," says Puri. This cautious approach helped when, in the aftermath of the 2008 global economic meltdown, several banks burnt their fingers as loan defaults climbed. Even today, HDFC Bank issues 75 per cent of new credit cards to its existing clients. "The hallmark of Puri's management style is his clarity of thought, quick decision making and keeping things simple," says Sashi Jagdishan, Chief Financial Officer at HDFC Bank. "He may sound like a tough boss but he has a kind heart if there are no issues related to integrity and attitude at the workplace." Puri, whose tenure will last until at least 2015, is now creating the building blocks for the next phase of growth. The bank is focusing on how technology can be used to cater to customers in metros and urban areas. He is building the bank's brand in smaller towns and cities. Half the bank's branches are located in semi-urban and rural areas but these contribute only 15 per cent to total revenue. He wants half the bank's revenue to come from these areas in five years. "It's a virgin market," he says. So far, the bank has had an impeccable track record. The only black mark is a Rs 4.50 crore fine imposed this year by the Reserve Bank of India for violation of know-your-customer guidelines after an expose by news portal Cobrapost. Was he upset? "Why should I be? There was not one transaction that went through our systems," defends Puri. Puri says his job is to think, set a vision and create an action plan for the bank, and it's for his senior executives to achieve those goals. He is clear he won't disturb his work-life balance. He spends his leisure time gardening, reading, listening to music, trekking and playing with his three dogs. Has the slowing Indian economy put any additional pressure on him? "What pressure?" he snaps back. Then he adds in a lighter vein: "Maybe I am passing the pressure on to my subordinates."